Dynamic Search Ads were recently added to all AdWords advertisers’ accounts. This nicely collided with me restarting the management of an old client of mine who had wanted to manage their AdWords campaigns in-house for a while. This advertiser has had access to Dynamic Search Ads for quite some time and starting a DSA campaign had great potential to generate extra profits from their AdWords campaigns without much extra work. In practice however, there were several flaws and the newly started DSA campaign moved the account from profitable to unprofitable. The advertiser had started a Dynamic Search Ads campaign in the beginning of 2012 and was relying on the campaign to generate new revenue for his AdWords account. Dynamic Search Ads can be great, but as many other things within AdWords, they require optimization and do not work optimally with standard settings. Dynamic Search Ads were invented to help bigger advertisers fill out the gaps in their AdWords advertising. One of the hurdles many big advertisers keep having is balancing out BMM keywords. Due to all the new searches happening on Google on a daily basis, you can’t harvest all the potential AdWords can provide by solely relying on Phrase Match and Exact Match keywords. To reach the full potential in AdWords you need to add BMM keywords to the mix, although some of the searches these might catch will undoubtedly be unprofitable for you. Seeing that many monthly searches on Google are new, trying to add negative keywords faster than Google can serve up your ads becomes a cat and mouse game. You will always lose a bit, but it’s part of the game. The profits from one-search, one-click, one-sale keywords usually upset the balance (if properly managed). The same challenge comes with Dynamic Search Ads. If you leave a Dynamic Search Ads campaign to fend for itself then you’ll run into a lot of wasted clicks. In the AdWords account I recently started managing again, Dynamic Search Ads had been increasing in costs/size over the past year from less than $500 per month to $3,500 in March 2013. Dynamic Search Ads were now taking up 32% of the overall AdWords budget but only attributed to 15% of the revenue. This was the first sign that something was wrong. By looking closer it became clear that the issue was related to allowing the DSA campaign to run solo: those search terms covered (or paused) in other campaigns were being taken over by the DSA campaign. Without any internal negative keywords we saw that previously profitable BMM keywords would now have almost no clicks due to the DSA campaign takeover. This caused a negative result because the dynamically generated ads were not performing as well as the individual ads previously created. We were more clicks than before, but the clicks we received from the DSA campaign converted lower than the same clicks coming from other keywords. Looking at the previous example, excluding search terms through negative keywords in your DSA campaign becomes essential for success. Even though Google says that DSA campaigns will not take over any searches your “active” campaigns are already producing, my findings tell me otherwise. 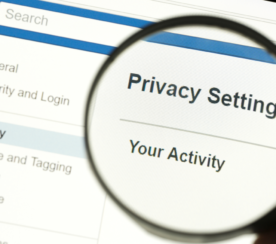 I’ve always been wary about letting Google control too much and this is an open and shut case. The process of including all your current keywords as negative keywords in your DSA campaigns is however not a small task. Seeing that DSA campaigns are intended for bigger websites, you’re most likely looking at a huge amount of keywords. In our case we had 43,967 active keywords last month. You can’t just add every keyword as negative in broad match as you would easily exclude all possible searches. Furthermore, you would have to review all your paused or deleted keywords and make sure you want the Dynamic Search Ads campaign to start showing ads for these. Including these as negative keywords through a systematic process would prove very time-consuming. The campaigns and keywords that you have paused or deleted before due to too low ROI will have a very big chance of popping up in your Dynamic Search Ads again. 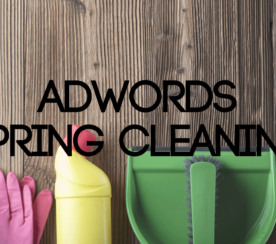 As we didn’t add these as negative terms in the Dynamic Search Ads, the campaign received a lot of clicks for keywords that were entirely irrelevant. One of the most delightful findings from opening an AdWords account with Dynamic Search Ads and having them running for over a year is the amount of available search terms you now have. We have a lot of data mining to do and I’m confident that we’ll find new and profitable keywords to be implemented as BMM, Phrase and Exact match keywords. Even though Dynamic Search Ads might sound like a wonderful way to get “passive income” through Google AdWords ads, it’s far from a set and forget method. DSA campaigns require a lot of setting up and maintenance in order to produce a sustainable positive ROI. I rarely say that some things within AdWords aren’t good for anyone. Through the years I’ve seen the weirdest practices producing great results, so I’ve learned to keep an open mind. 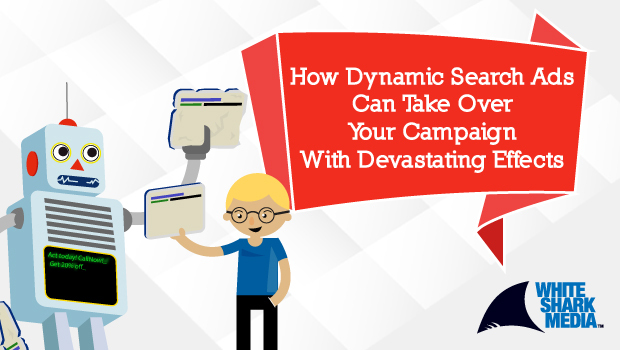 If Dynamic Search Ads can fulfill its promises then it can be an immense addition to your AdWords campaigns. 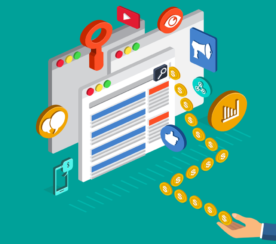 However, to achieve the kind of promised results you will need to tweak it a lot and some might say that you’re better off taking the time to work on your own AdWords campaigns. For another case study on Dynamic Search Ads I recommend reading Elizabeth Marsten’s post on Portent.com about the subject.